Note: Today's post is part of the CW blog chain. The topic is "Celebrate". Please check out my sidebar, further down on the right, to see some great posts by other writers. The past few years have been difficult for my husband, our families, and me. We’ve lost ten family members. So I don’t feel like celebrating. But then I’m reminded of something that happened, and it gives me comfort, especially in times like these. Five years ago, I pored over every Amish book I could get my hands on. The stories brought to mind simpler times, good people, and wholesome food. My stomach pulled into a knot. God, are you getting ready to take him home? You know I can’t live without him. Wait, I’m sorry. You’re the most important person in my life, but you know what I mean, don’t you? Of course you do. You’re God. The morning of our trip, after only three hours of sleep, my alarm clock nearly jolted me off the mattress. I rolled out of bed, my stomach churning. Even though we were going to Amish country, I still had issues. I don’t like to travel far away from home, but because of my husband’s desire, I had to. What if something terrible were to happen? I couldn’t rob the man of his last request. Besides, I had this feeling that the Big Guy wanted me to travel halfway across the country, that He had something to say to me once I reached our final destination. Hours later, and many miles down the interstate, acid crept up the back of my throat. Did I mention that my stomach assaults me when I don’t get enough sleep? Right before we reached Lancaster, when I honestly thought I couldn’t take anymore, I caught sight of a viaduct. The words Jesus Loves You were painted in blue across the side. Lucky for my husband, calm swept over me. Thank you, Lord. We finally pulled into the parking lot at the hotel. Visions of a soft bed with plump pillows floated across my mind. But I did, in my clothes, on top of the bedspread, and I survived. A few days later, we made our way to Kill Devil Hills, North Carolina. I liked the strange name for the city. Who wouldn’t want to kill old Slewfoot? When I walked in our room, relief washed over me. A clean patchwork bedspread lay over the bed. Plump pillows adorned the top. A table and chairs sat nestled in the corner, where we could view the ocean right outside our window. We strolled along the beach, looked for seashells, and ate the best food. It was heaven, I tell you. Only one thing bothered me. The Big Guy had been silent the whole time. I felt His presence, especially when the waves slapped against the shore, but I still sensed something missing. After turning in for bed one evening, some harsh realizations hit me. I’d taken care of others for years, including my elderly mother, but didn’t realize how angry I’d become in the process. I silently prayed, repenting of my testy old self. Pardon my sins, Lord, for I know they are many. I walked down the shoreline and spotted a mound in the sand. A piece of a blonde-colored shell peeked out, about the size of a nickel, and I pulled it free, brushing the granules away to reveal my treasure. Whirling around, I combed the area, wondering if someone had played a trick on me, but nobody else was there, just my husband, who still sat at the other end of the beach. Gooseflesh peppered my arms. Guarding my prized possession, I brought it home and put it in my desk. It’s been there ever since. 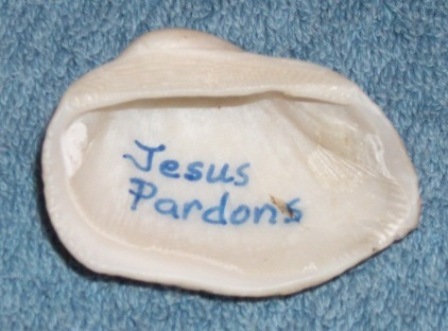 Yes, the past few years have been tough, but when things really get me down, I take out my seashell and remember God’s goodness. I've often wondered who put it there, but it doesn't matter. I know the One who was behind it. And He knew I'd be there to find it exactly when I did. There’s always a reason to celebrate, even when I don't think that there is, and it all started with a book, and ended with a few little words in blue. Oh, I love that line, Jack. I'll have to remember that. Thanks for stopping. I really appreciate it. The only reason the kids were missing is because we don't have any, E.G. At least not on this planet. I'll see them again, though...someday. Wow is right, that gave me goose bumps!! That is an amazing story, thanks for taking the time to share it with us Deborah!! And thank you for taking the time to share it with me, Chris!! Goosebumps from me too! One time I was on a walk, praying and asked the Holy Spirit to take over my prayers. At that moment, I bent over and picked up a marble, that was lying in the gutter. It reminded me to pray for the members of one of my writing group, called "The Marbles." I went home and wrote the group, saying I didn't know what was going on in their lives, but the Holy Spirit had me praying for them. I received several private emails from members telling me of crises happening in their lives. My response: be comforted; obviously God is aware of the crises and cares deeply. Love your story about "The Marbles." There's always a reason for everything, isn't there? As always, thanks for stopping, Carol. I know. I've often wondered if he or she had any idea, Tracy. And I'm also sorry for your loss. I hope things are going a little bit better for you. Wonderful story, Deborah - thanks for sharing it. Many people would call that an amazing coincidence, but we know it was God taking care of it all! Amen to that, Bill. The Big Guy was in charge the whole time. I'll never forget it. What a beautiful testimony, Deborah. God speaks in ways and at times when we don't expect it but desperately need it. Thanks for sharing your story. Thank you, Traci. And thanks for sharing it with me. Deborah, what a precious thing for God to do. He amazes me! I love how the message on the viaduct and the words on the shell were both in blue. Just another little hint that none of it was a coincidence. Thanks so much for stopping by, and for your words of encouragement. I appreciate it.